Home In Dubai! Fawad Khan and Sonam Kapoor in Dubai! Sonam Kapoor and Fawad Khan are leaving no stone unturned for promoting their upcoming film,Khoobsurat. The Khoobsurat jodi were in Dubai tonight to meet their fans and address the media at The Grand Hyatt for a promotional event organized by Essar Events. Sonam and Fawad’s style statements have charmed the fashionistas with their exquisite outfits, especially since they started promoting their upcoming movie Khoobsurat uncompromisingly. Sonam who is a Physiotherapist in her forthcoming film, was seen wearing a colorful dress and was definitely looking Khoobsurat. On the other hand, the actor known for his admirable acting skills in Zindagi Gulzar Hai, a show of TV channel Zindagi, kept the whole elegant look appearing in a dashing and looking nothing less than a prince charming. With his killer looks, Fawad Khan, who has stepped into the Indian film industry in the role of Prince Vikram Singh Rathore, is making all the girls go week in their knees. The Pakistani actor, who is going to make his Bollywood debut with Khoobsurat, says he never expected that he would become so popular in India. Despite the rigorous promotions, the two look spectacular together and we cannot get through of their crackling chemistry. Fashion icon Sonam will be seen as the notorious, fun loving girl in the movie while Pakistani, and now Indian heartthrob too, Fawad Khan will play the character of a royal prince. 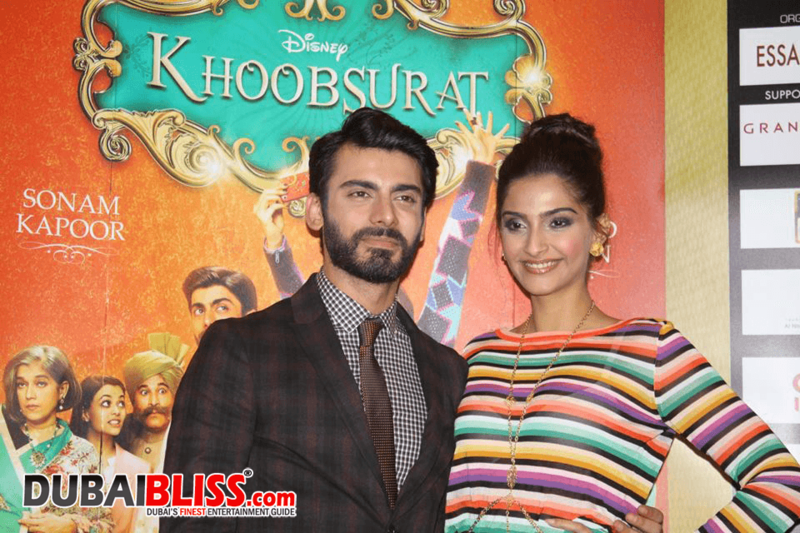 Khoobsurat is said to be a remake of the 1980s Rekha-starrer Khubsoorat. Directed by Shashanka Ghosh, the film is set to release on September 19, 2014. Next articleRDB brothers fight in court, fans shocked!